Toyota Motor Company started in 1937 as an offspring of the Toyoda Automatic Loom Works, the textile loom maker. Thanks to its famous production system, Toyota grew from a tiny company into the largest car manufacturer in the world. In the early 60's Japan economy was booming and Toyota recognized the need for a family car for people living in suburbs to get around. That's when the Corolla was born. The first model went on sale in November of 1966 and since then, the Corolla became the world's most popular car. There are several reports of a water pump failing. The cost to replace a water pump ranges between $250 and $550. When replacing a water pump, it's a good idea to change the drive belt as well. Symptoms of a failing water pump include pinkish coolant leaks around the water pump and whining / buzzing noise coming from the water pump area. See these videos for more info. Oil leaks from a timing chain cover are reported by several owners. See these Youtube videos explaining the repair. The service bulletin T-SB-0087-09 for the 2009 Corolla / Matrix describes a problem where a brief knocking /rattling noise from the 2ZR engine when started cold is caused by a faulty camshaft timing gear assembly (VVT gear). The gear must be replaced to correct the problem. According to the bulletin, the repair labor is estimated at 1.5 hours. The part (gear assembly) is sold online for just over $200. If out of warranty, the repair could cost from $380 to $590. Several owners mentioned replacing an alternator ($400-$680). Aftermarket parts are cheaper. Exhaust leaks and rattling heat shields are not uncommon too. A loose heat shield may cause a metal rattle coming from under the car that is more noticeable at certain rpm. Repairs are not very expensive. Ignition coils can fail causing the engine to misfire. They are easy to replace. When replacing an ignition coil, it's best to change all the spark plugs as well. An OEM ignition coil is priced between $86 and $139 online. Aftermarket parts are cheaper. A bad wheel bearing can cause a humming noise that is more noticeable when driving at highway speeds. Replacing a wheel bearing can cost from $260 to $370. Front struts can leak at higher mileage. Replacing both struts can cost up to $780 with an alignment. Toyota announced the Warranty Enhancement Program ZE7 to address an excessive oil consumption in some models. This forum has some information. Engine: The base 132-hp 1.8L 4-cylinder DOHC 2ZR engine is simple and reliable. With good maintenance it can last for well over 200K miles. The Corolla XRS comes with the 158-hp 2.4L 4-cylinder, shared with the Camry and RAV4. Timing belt or chain: Both, the 1.8L and 2.4L engines have a timing chain; there is no timing belt. A timing chain doesn't need to be replaced unless there is a problem with it. Fuel Economy: The EPA rates the 2010-2012 1.8L automatic Corolla at 26/34 mpg (9.0/6.9 L/100 km), which means that with mostly highway driving you can get up to 380 miles (612 km) on a 13.2-gallon (50.0L) tank. The manual transmission offers even better fuel economy: 28/35 mpg or 8.4/6.7 liters per hundred kilometers. With a manual transmission, you will be saving around 100 dollars a year on fuel costs compared to the automatic. 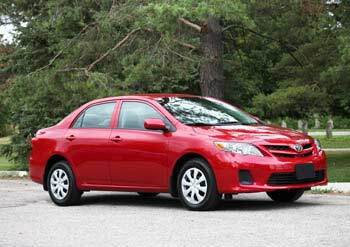 Model lineup: In the US, the 2009 Corolla was offered in base, S, LE, upscale XLE and sporty XRS trims. The XLE and XRS were discontinued for 2011 and the L trim became the base level for 2012. In Canada, four models were offered: CE, LE, S and XRS. The S and well-equipped LE are the most widely available trim levels on the used car market. Year to year changes: Toyota Corolla got minor face lift for 2011 with new front grill, head- and taillights, updated bumpers and trunk lid. 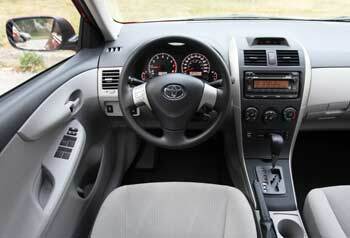 For 2012, the Corolla received a few feature upgrades, including a new standard audio system with the USB port, Bluetooth and steering audio controls for the US and Canadian LE trim. 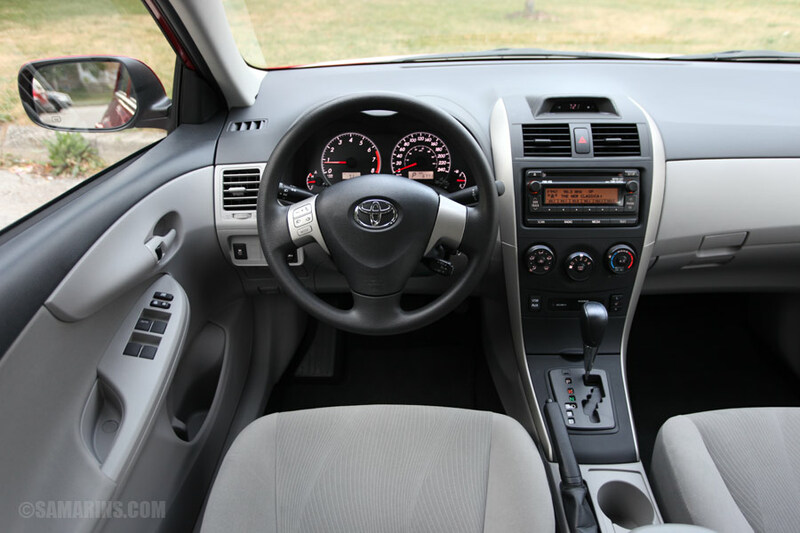 The US Corolla L received power windows, power door locks and remote keyless entry. Mechanical: The Corolla XRS has disc brakes on all 4 wheels; other models come with rear drum brakes. The steering is electrically powered. Antilock brakes are standard. Vehicle Stability control is optional in early models; standard on all US models from 2010. The Canadian Corolla received standard Vehicle Stability Control for 2011. Handling and ride: The Corolla is very easy to drive. The ride is soft and quiet; road imperfections are well absorbed by the suspension. The 1.8L engine has enough power for daily commuting. The electrical steering is light and feels fine in the city, but is a bit vague around the center position when driving on the highway.